Ricky Holmes had a thinly-veiled dig at Pompey boss Andy Awford after inspiring 10-man Northampton Town to a 5-1 win at Accrington Stanley. 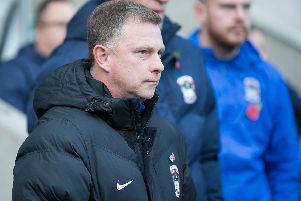 Last term’s player of the year opened the scoring for the Cobblers inside five minutes – his second goal in three games – and claimed two assists in their convincing win as they climbed up to 12th place in the table. The winger was deemed surplus to requirements by Awford and allowed to leave on a free transfer last week. But after his team’s victory, Holmes tweeted: ‘A goal, two assist, 10 men for 60 mins and three points in the bag. I swear 6 weeks ago I got told I wernt good enough’.